Are NAS Drives a Good Idea? Are NAS Drives a Good Idea? Small offices trying to avoid the complexity of a full file server often get enticed by NAS drives – Network Attached Storage. These little appliances promise the benefits of a full file server with plug-and-play simplicity: just plug the unit into your network, go through a quick, self-guided setup, and voilà, you now have network file sharing. Simple and cheap. Are there any drawbacks to this scenario? What Exactly is a NAS Drive? First, let’s get under the hood of a NAS drive to understand exactly what’s going on. From the outside, a NAS looks like a robust disk drive. So it’s easy to think that a NAS drive is, in fact, simply a network disk drive that all of your machines share. In reality, though, that NAS drive is a full-fledged computer – a very compact, very specialized server in a tiny box. But if you think about it, that makes sense. A drive has to be managed by a computer. And the networking has to be performed by a computer. And the handling of users and user permissions has to involve a computer. What sort of computer is it? Typically, these NAS drives run some flavor of UNIX – often LINUX. UNIX is the operating system of choice because of its stability, its low hardware requirements, and its ability to be customized and fine-tuned to very specific tasks. So Are There Any Drawbacks to NAS Drives? There actually are three potential drawbacks to a NAS drive, one of them minor and the others quite significant. First, NAS drives often run on slow hardware. Like we said, UNIX can be optimized to run on very low-end hardware, and that’s often what you get. On your cheaper NAS drives, the hardware might not be any more powerful than you’d find on a low-end laptop computer. Of course, you can’t generalize all NAS drives this way, and some do run on fast hardware. But we will say that when users contact our Technical Support complaining that FileCenter’s running painfully slow, as often as not, they’re using a NAS drive. The second drawback should give you more pause. Recall that the vast majority of NAS drives run some form of UNIX. Let’s actually flip that statement around: the vast majority of NAS drives don’t run Windows. Why does this matter? In many cases it doesn’t. But if you plan on being able to search your files, it does matter. An awful lot. You see, FileCenter uses Windows Search as its search engine. Why? Because it’s an outstanding engine. Powerful, unobtrusive, and keeps its indexes constantly current. Not only that, searching network files and sharing network indexes is transparent and automatic … as long as the network files are on a Windows machine. And there’s the drawback. You cannot search network files that don’t reside on a Windows machine. So if that matters to you, forget about a NAS drive. Finally, because of the closed nature of the NAS drive’s operating system, you can’t install any software on it. When does that matter? Well, let’s take backup for example. You’re stuck using whatever backup utility comes on your NAS drive (unless you run the backups from another computer). And how about a more current example – cloud storage. Google Drive, DropBox, OneDrive, SugarSync … these services have revolutionized your ability to access your files anytime you want from anywhere. That is, unless you use a NAS drive. You can’t install these services on a NAS drive. True, many NAS drives bundle their own cloud storage service. But your options at that point are limited to one single service that almost no-one else uses. There is a great alternative. 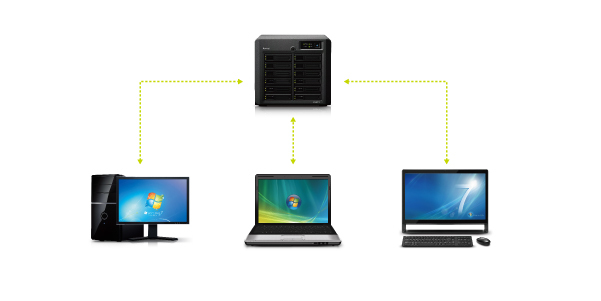 Buy a mid-range Windows desktop machine and make it your file server. It’s probably about the same price as a NAS drive, has hardware that’s at least as good, it will perform just as well, and it will still allow you to use search. It will also allow you other options that probably aren’t available on a NAS drive, like Cloud-based backup and storage services. You see, we tend to get caught in the mindset that network file sharing requires a full-fledged server. But that’s simply not true, especially for small offices that have less than half a dozen users – the offices that are attracted to NAS drives. Any Windows machine is capable of working as a basic server. All you need to do is hire a college kid for an hour to set it up. Or, if you’re even slightly technical, find a tutorial on the web and set it up yourself. It’s not hard at all. We understand the desire to keep things simple. But sometimes the “simple” solution restricts your options too much. That will often be true of NAS drives. Especially considering that other “simple” solutions exist which don’t restrict you at all.